To increase understanding of the human form, plastic surgery students at Louisiana State University and Tulane are replacing scalpels with sculpting tools. Sculpting class at the New Orleans Academy of Fine Arts on a Wednesday night looks more like prepping for surgery than an art class—the bright white studio is filled with med school students wearing green and blue scrubs. They meticulously carve away at their work; but in this case, clay busts take the place of live patients, and wooden carving tools replace scalpels. This annual art class is a joint program offered through the plastic surgery programs at Louisiana State University and Tulane. Once a week during the six-week course, students spend three hours creating clay sculptures of a live model. This hands-on learning environment allows students to hone their expertise in human anatomy. The goal of the class, according to Dr. Michael Moses, clinical professor in plastic surgery at Tulane and LSU, is not only to enhance students’ understanding of the human body but also to teach them to communicate with patients and fellow doctors about the work they do. Moses created the optional class about a decade ago, and since that time about forty students have completed the course. Only one or two classes of its kind are offered at other plastic surgery programs in the country. Moses explained that the first art classes offered ten years ago were drawing classes; but they were expanded to include sculpture, a discipline that gives students a firmer grasp on symmetry and the human form. “It turns out that sculpture has a whole different set of benefits for plastic surgery residents than drawing. Sculpture is a much better way for them to learn about body proportions and placement of features … all of which is incredibly useful,” said Moses, who would have liked to have had a chance to take such a course while he was in medical school. “Personally, I think it makes them much better plastic surgeons.” He himself has taken private art classes in order to strengthen his own skills, “I draw all of the time for my patients,” Moses said. The sculpture class is taught by New Orleans artist Kim Bernadas, who is known for her public art, mostly cast bronze sculptures. 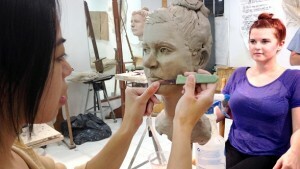 Most recently she completed the Walter Dumas bust for Baton Rouge Community College; she has also created an Ed McKee plaque for Livingston Parish and the first post-Katrina public art commission for the City of New Orleans, a Garden District sculpture called “Birth of a Muse.” A former ballet instructor and physical therapist, Bernadas is uniquely qualified to teach such a course, but she holds that such anatomical knowledge is not necessary. “Sometimes, because I’ve worked in that field, I have somewhat more medical knowledge; but artistically, any artist who’s worth their salt would know exactly how to teach this and has a working knowledge of the figure and form,” said Bernadas. Mayo is in his final year of the three-year plastic surgery program and is currently completing his residency. The program places residents at affiliated hospitals throughout the metro area, including West Jefferson Medical Center, the Children’s Hospital of New Orleans, Our Lady of the Lake Regional Medical Center, and the Houma Outpatient Surgery Center. Mayo explained that rotations can be tough; having the chance to meet with his peers once a week for the sculpture class brings the cohort together and also gives them a chance to relax a little.